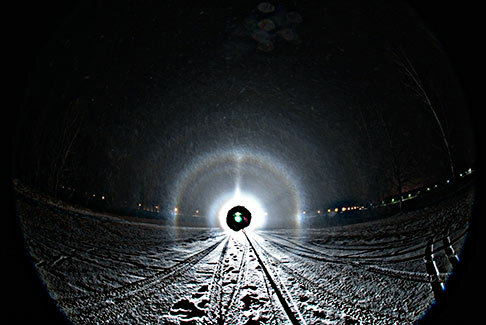 Spotlight beam revealed a bunch of pyramidal crystal halos on 14th December 2009 at Janakkala, Finland. I drove to Kalpalinna ski resort, where snow guns were turned on. Immediately after walking into the spotlight beam I noticed a halo well inside the 22° ring. Initially I thought that surely this is a slice of the Minnaert cigar ( 1 ), but the ring just stayed there and the crystal swarm seemed homogeneous, so I concluded that this is the 9° halo. At the camera's LCD display the 18°/20° (?) and 35° halos could easily be seen. After first seeing them in the photo I thought I was able to see them visually too, but that was not certain. I did mess up the crystal sample, since the most-likely-pyramidal-crystals are distorted and round - the gear was still too warm during the sampling. On the other hand, if I would have waited longer, there would not be any signs of pyramids in crystal samples, since the pyramidal phase was gone in less than 10 minutes and did not reoccur during the rest of the night. By clicking the image above the gallery opens. Awesome we finally now have odd radius halos in spotlight!!! Nice job well done! Any pyramidal plate arcs? This is great Jukka. Like Michael says, it is the first time we have odd radii in spotlight but also first time that we have confirmed odd radii from snow guns. Of course, it is pretty obvious snow guns can make odd radii, as we regularly see one or two pyramidal crystals in the samples, but still the display was missing. Getting odd radii diamond dust in Finland generally is difficult, because we don't have much at all of the low temps needed for major pyramid crystal development. And with snow guns, when it is low temps, it normally so late in the season that they have finished snow gunning, or they don't operate because the pipes freeze. The 16 C temp for this odd radii display must be record warm. In the same night Aho, Agnes and I were in Himos but no odd radii despite lower temps. Thanks. To be at the right spot at the right time was pure luck. By the way, when the display faded away (or more accurately changed into a poor quality plate- and column display) it happened within 20 seconds. Dramatic changes. Congratulations, Jukka. We've been expecting for a while that the time would soon come for the first odd-radius lamp display pics. It's great you managed to photograph it! You were really at the right spot at the right time. But it's not only pure luck. We mustn't forget the effort and the great amount of work and dedication that lies behind such observation!